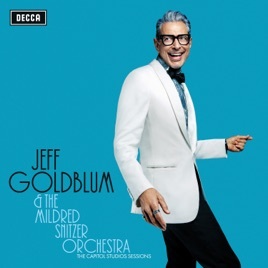 Leading his peppy small combo (named after a family friend—there’s no Mildred Snitzer here), Hollywood vet and Jurassic Park star-turned-jazz pianist Jeff Goldblum intends this debut outing to capture the friendly-hang atmosphere of his weekly gig at the Rockwell in LA. But as the album title makes clear, they recorded at Capitol Studios—one of the city’s renowned sonic temples—albeit with a live audience. Noted producer (and bassist) Larry Klein gets a big, bright sound and lends his curatorial sense to the program, mining laidback and irreverent vocal numbers associated with Dinah Washington, Nat “King” Cole, Nina Simone, and Rosemary Clooney, as well as instrumentals by the likes of Herbie Hancock (“Cantaloupe Island”) and Charles Mingus (“Nostalgia in Times Square”). The Rodgers & Hart ballad “It Never Entered My Mind,” played with featured trumpeter Till Brönner in the manner of Miles Davis and Red Garland, is another nod to canonical modern jazz. Goldblum is a tasteful, respectable player, but also an excellent MC, drawing out the best in singers Haley Reinhart, Imelda May, and showstopper Sarah Silverman, whose pitch and delivery on “Me and My Shadow” do not disappoint. That ’20s classic became a 1962 vehicle for Sinatra and Sammy Davis, Jr., and much like the Rat Packers added their own newsy line about “Bobby and JFK,” Goldblum and Silverman throw in topical barbs about climate change and the name of a certain Washington football team.